Are you looking for coaching institutes for Physics, Chemistry, Biology and Mathematics in Rampura? 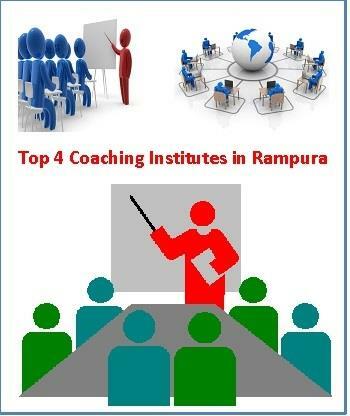 Read this article for the detailed information of top 4 science and mathematics coaching institutes in Rampura, District Neemuch. Every parent and student needs coaching institute for the preparations of the board examination, competition exams, NEET exam, JEE Mains , etc. The coaching institutes concentrate on the basic concepts and prepare the students for competition examination by providing tips and tricks. They also have collaboration with the schools for the appearance of the students in the board examination if they are preparing for competitive exams like NEET, JEE Mains, etc. In the coaching institute, you can find a good platform for learning and a very good atmosphere for the preparation of the competition examination. Coaching institutions also provide remedial classes and students can ask their problems with concerned teachers. The coaching institutes also take assessment every month and provide the rank to the students which enable them to find out their position in the class. Now a day they also send the progressive reports of the students to the parents through the digital medium like WhatsApp, SMS, mobile programs, etc. Patel coaching classes were started by Mr. Kailash Patidar who is the principal of S.L. Patel Higher Secondary school, Rampura , in the year 1990. Patel coaching classes provide coaching of Chemistry for the students from standard 11th to M.Sc. The fees vary from 3000 INR per session to 5000 INR per session. This is the only one coaching class which provides the coaching of chemistry in Rampura. Mr. Kailash Patidar takes the tests after every chapter and provides the rank to the students. If you need to learn the concept of chemistry by heart, this the best coaching institute in the Neemuch district. Hakimi Coaching Institute was started by the Hakim sir in the year 1995. Hakim sir provides coaching for the students from standard VI to X. Hakim sir provides coaching of science and mathematics. The fees for the students from VI to X is rupees 400 per month. Hakim sir also provides coaching of biology for the students of XI and XII class. The fees for the biology subject is Rupees 3000 per session. This is the only one coaching class for the subject of biology in Rampura and Manasa tehsil. Hakim sir also arranges career guidance classes for the students of the XII classes so that they can select a good career after 12th biology . The head of the Uchhana coaching classes is Mr Amitabh Uchhana a well-known lecturer of physics in Govt. Girls Higher Secondary School, Rampura . The coaching institute provides coaching of physics in English and Hindi medium. This is one of the best coaching institutes for the students of physics in Rampura. The charges for the students of XI and XII are only Rupees 2500 per session. Shree Patidaar coaching classes were started by Mr Lalit Patidaar in the year 2012. The institute provides coaching of Physics and Mathematics for the students from High School level to college level. The fees vary from 2000 per session to 3000 per session. The monthly assessment, computerized test papers, personal developments, etc. are the main specification of the institute Mrs. Yashoda patidar also provide the coaching of English in the coaching class. The fees for English coaching is 1000 INR per session. If you want admission of your children for the preparation of board examination, you can contact the above coaching institutes for different subjects. The coaching institutes also provide simple payment method if required. You can pay through installments if not possible to submit full payment at the time of admission.